Munster Rugby (Irish: Rugbaí Mumhan) is one of the four professional provincial rugby teams from the island of Ireland. They compete in the Pro14 and the European Rugby Champions Cup. The team represents the IRFU Munster Branch, which is one of four primary branches of the IRFU, and is responsible for rugby union throughout the geographical Irish province of Munster. Their main home ground is Thomond Park, Limerick, though some smaller profile games are played at Irish Independent Park, Cork. The team motto is "To the brave and faithful, nothing is impossible." This is derived from the motto of the MacCarthy clan – "Forti et Fideli nihil difficile". Munster was officially founded in 1879, at the same time as Leinster and Ulster, with Connacht being founded ten years later in 1889. The first Interprovincial matches between Leinster, Ulster and Munster, however, were held in 1875. The founding of the Munster branch of the IRFU was intended to organise and oversee the game within the province and prevent any club bias by providing neutral selectors for the representative side. In amateur days, the four Irish provinces played against each other in the IRFU Interprovincial Championship and also played touring international sides. Munster traditionally drew its strength from the clubs of Limerick, with the game popular in the city and widely played at all levels. Teams such as Shannon, Garryowen and Young Munster built up fierce rivalries with one another, helping push standards in the province higher as a result. Munster has a great tradition of competitiveness and impassioned displays against touring sides. The first touring side to play Munster were the famous Original All Blacks led by Dave Gallaher, who lined out against Munster in the Markets Field, Limerick in November 1905. Munster were defeated that day 33–0. Throughout the years, Munster were to record a number of near-misses and last minute defeats against South Africa, Australia and New Zealand. The first tangible result against a touring side was to come in 1958, when the Wallabies were held to a 3–3 draw in Thomond Park. Munster became the first Irish provincial side to defeat a major touring team when they defeated Australia 11–8 in Musgrave Park, Cork on 25 January 1967. Munster were captained that day by Tom Kiernan. Munster first played the All Blacks in 1905, losing 33–0 on the occasion. They have played each other many times since then. Munster drew with New Zealand 3–3 in 1973 and, in 1978, became, at the time, the only Irish side to have beaten the All Blacks. The 12–0 victory occurred on Tuesday 31 October 1978 at Thomond Park, in front of a crowd of 12,000, though many times that number still claim to have been present, such was the occasion. Christy Cantillon scored a try with Tony Ward converting. Ward also added a drop-goal in each half. Until the national team's victory on 5 November 2016, it was the only time an All Blacks team lost to any Irish side and forms part of Munster Rugby mythology. A stage play named Alone it Stands (by John Breen) and a book entitled Stand Up and Fight: When Munster Beat the All Blacks by Alan English were both based on the event. Both have been commercially successful. Alone it Stands has had several sell-out runs in Ireland and abroad. Stand Up and Fight was a bestseller in 2005. The All Blacks returned to Thomond Park in November 2008 to commemorate the 30th anniversary of the 1978 match and to celebrate the opening of the new stadium. After 76 minutes of the match, Munster were winning 16–13, but a late try from Joe Rokocoko meant the All Blacks won 18–16. On 11 November 2016, Munster welcomed the Māori All Blacks to Thomond Park. The Māori players paid tribute to Anthony Foley by placing a jersey with his initials on the halfway line before performing the Haka. Māori captain Ash Dixon then presented the jersey to Foley's sons. Munster went on to win the historic game 27–14. Like the All Blacks, Munster have played Australia many times. They first met in 1947, where Australia won 6–5. Munster claimed their first victory over the Wallabies in 1967, when they won 11–8. In 1992, Australia, reigning world champions, having won the 1991 Rugby World Cup, visited Munster as part of a European Tour. Munster won 22–19 in a rough encounter in Cork. Ten years later, London newspaper The Daily Telegraph recounted part of the legend in a feature on Munster prop Peter Clohessy: "The then Wallabies coach, Bob Dwyer, who was not a man who readily accepted that opposition sides could legitimately score more points than his team, immediately branded the Munster Number 3 a 'disgrace'. It had been a typically rugged, robust and memorable Munster triumph, with leather and fists flying on both sides. Clohessy, who wouldn't generally be known for misconduct, was no more guilty than the next man but world champions are not supposed to lose against a hastily assembled Irish provincial XV. There had to be a reason, an excuse, and Dwyer rounded on Clohessy". History repeated itself in 2010 when Munster defeated the Wallabies 15–6, with their Australian fly-half, Paul Warwick, kicking all fifteen points (three penalties and 2 drop goals). The match was played in ferocious weather, with Munster playing into a gale-force wind and driving rain in the first half. Indeed, the conditions made the half time score of 6–6 all the more significant, as Australia could neither cope with the weather nor the Munster pressure in the second half. On 26 August 1995, the International Rugby Board declared rugby union an "open" game, removing all restrictions on payments or benefits to those connected with the game. This was done due to a committee conclusion having an open game was the only way to end the hypocrisy of shamateurism, and keep control of the sport. The threat to amateur rugby union mostly prevalent in the Southern hemisphere, particularly in Australia where Super League was threatening to entice players to rugby league with large salaries. In Ireland, the four provincial teams were the only teams to go professional, while their smaller constituent clubs remained amateur. The 1995–96 season saw the first ever Heineken Cup, a new tournament set up for European clubs. The Irish were allocated three places in the competition, with these places going to Leinster, Munster and Ulster. The team failed to advance beyond the pool stages however. Munster finally reached the Heineken Cup quarter-finals in 1998–99 Heineken Cup, after three years of not being able to get out of the group stages. Munster's first appearance in the Heineken Cup's final was in the 1999–2000 Heineken Cup, where they lost by one point to Northampton at Twickenham. Nevertheless, the season was most memorable with a 25–31 win over Toulouse in Bordeaux. Their good form and bad luck continued in the following season, 2000–01, with a semi-final defeat to Stade Français, again by one point, where a try from John O'Neill  was disallowed by the referee, as he deemed the ball to be out over the dead-ball line. In the 2001–02 Heineken Cup, Munster lost the last match of their pool at Castres, but qualified as best runners-up. Munster beat Stade Français 16–14 in Paris, the only try of the game coming from Anthony Horgan. It was then on to Béziers to meet Castres again for the semi-final. Munster were triumphant and went to the final at Millennium Stadium to meet the reigning champions, Leicester. Munster lost a tight game remembered as 'the hand of Back' final, as the Leicester flanker used his hand illegally in a scrum when Munster had a last-chance attack. Munster also reached the final of the Celtic League in this season, but lost 24–20 to Leinster at Lansdowne Road, Dublin. In 2002–03, Munster reached the quarter-finals after a win against Gloucester, later issued on VHS under the title "The Miracle Match". In this game, Munster needed to win by a margin of at least 27 points and score a minimum of four tries to earn a quarter-final berth. They won 33–6 with four tries in a game that has become part of Munster Rugby folklore. They again faced Leicester, this time at the Tigers' home of Welford Road, and defeated the reigning champions to progress to the semi-finals. They faced Toulouse in the semi-finals and lost out on a place in the final, after losing by a single point in France. In this season, Munster won the Celtic League for the first time, by beating Neath-Swansea Ospreys 37–17 at the Millennium Stadium, Cardiff. In 2003–04 it was more of the same. After an assured performance in the Pool stage, Munster defeated Stade Français at Thomond Park to set up a semi-final date with English champions, London Wasps. This match has gone down as one of the best Heineken Cup matches of all time. Although leading by 10 points in the second half, and having lost Ronan O'Gara to injury early on, they succumbed to 2 Wasps tries in injury time, resulting in a Wasps v Toulouse final. Munster finished in a disappointing seventh position in the 2003–04 season of the Celtic League. In 2008, Munster signed Doug Howlett, the all-time leading try scorer for New Zealand. That season's Heineken Cup saw Munster finish top in their group, and they went on to reach the final for the second time in three years beating Saracens in the semi final. The final, again held at the Millennium Stadium, saw Munster defeat Toulouse 16–13 to claim their second Heineken Cup title in 3 years. Munster finished third in the Celtic League in the 2007–08 season. In May 2008, Director of Coaching Declan Kidney left to take up the head coach job with Ireland. Munster ensured continuity by promoting Australian Tony McGahan to the position from within the coaching setup. In the 2008–09 Heineken Cup, Munster once again topped their group and reached the semi-final, but lost to arch-rivals Leinster 25–6, a match attended by a then world record crowd of over 82,200. On 30 April 2009, Munster clinched the Celtic League for the second time in their history, after their closest challengers Ospreys beat Dragons but failed to claim a bonus point. This handed the title to Munster who could not be overtaken at the top of the table. The 2009–10 season saw Munster finish top of their Heineken Cup pool once again. Victories over Northampton Saints, French Top 14 champions USA Perpignan and Italian side Benetton saw Munster qualify for the Heineken Cup Quarter Finals for a record 12th consecutive year. The match took place at Thomond Park, where Munster played Northampton Saints for the third time that season and won 33–19. They lost 18–7 in the semi-finals against Biarritz at the Anoeta. Munster came 4th in the Celtic League, but because this season saw the introduction of a play off system for the top four teams, Munster met and lost 16–6 to Leinster in the play-off semi final. The 2010–11 season saw Munster drawn in Pool 3 of the Heineken Cup alongside Ospreys, London Irish and Toulon. Munster lost 23–17 away to London Irish, before defeating RC Toulon 45–18 at Thomond Park. Munster defeated Ospreys 22–16, but lost the reverse fixture at Liberty Stadium 19–15. In Round 5 Munster went to Toulon, losing 32–16. As a result, Munster failed to qualify for the quarter finals of the Heineken Cup for the first time in 13 years. Munster won their final pool game, at home to London Irish, 28–14, and qualified for the 2010–11 European Challenge Cup quarter-finals. Munster defeated Leinster 24–23 on 2 April 2011 in the Celtic League, ending a run of 5 straight defeats. Munster beat Brive 37–42 in their Challenge Cup quarter final to qualify for the semi-final against Harlequins on 30 April. Munster lost the semi-final in Thomond Park 20–12. Munster finished first in the 2010–11 Celtic League. They beat Ospreys 18–11 in their semi-final to set up a Grand Final with Leinster, which Munster won 19–9, securing a third Celtic League title. Munster were drawn in Pool One for the 2011–12 Heineken Cup, alongside Northampton Saints, Scarlets and Castres Olympique. They beat Northampton 23–21 in the first pool game at Thomond Park, after an 83rd minute drop-goal from Ronan O'Gara. In their second pool game, Munster beat Castres 24–27, with O'Gara again scoring an overtime drop-goal to secure victory. Munster won their third pool game, away to Scarlets, 14–17. In the return fixture a week later, Munster won 19–13. A 26–10 win over Castres on 14 January 2012 ensured that Munster qualified for the quarter-finals of the 2011–12 Heineken Cup. Munster ended their 2011–12 Heineken Cup Pool 1 games with a 36–51 victory against Northampton Saints, securing the top seed in the quarter-finals and winning 6 out of 6 pool matches for the first time. Munster lost their quarter-final against Ulster 16–22, losing just their second match at home in the Heineken Cup. Munster finished third in the 2011–12 Pro12, and played Ospreys away in the play-off semi-finals, losing 45–10. It was announced on 22 February 2012 that McGahan would be leaving Munster at the end of the 2011–12 season, to take up a role of coaching co-ordinator on Australia's management team. Rob Penney, coach of Canterbury and New Zealand U20, was chosen to succeed McGahan, being unveiled as the next Munster coach on 2 May 2012. Munster were again drawn in Pool One for the 2012–13 Heineken Cup, with Saracens, Edinburgh and Racing 92. The campaign opened with a 22–17 away defeat at the hands of Racing 92. Munster won their second game, at home to Edinburgh, 33–0. The December back-to-back games began with a home fixture against Saracens, which Munster won 15–9. In the reverse fixture, Munster lost 19–13. In the fifth round of pool fixtures, Munster beat Edinburgh 17–26. Munster had to win their final pool game, against Racing 92, with a try bonus-point to have a chance of qualifying for the quarter-finals. Munster won the game 29–6, scoring five tries, including a hat-trick from Simon Zebo. Leicester Tigers 9–5 victory over Toulouse ensured that Munster qualified as the second-best runner up, and they played Harlequins in the quarter-finals. Munster won the quarter-final 12–18, advancing to the semi-final, which they lost 16–10 to ASM Clermont Auvergne on 27 April 2013. Munster finished sixth in the 2012–13 Pro12. Munster were drawn in Pool 6 for the 2013–14 Heineken Cup, alongside Perpignan, Edinburgh and Gloucester. Edinburgh beat Munster 29–23 in the opening pool fixture on 12 October 2013. In their second pool game on 19 October 2013, Munster beat Gloucester 26–10. Munster beat Perpignan 36–8 in Round 3. In the Round 4 reverse fixture on 14 December 2013, Munster won 17–18 at Perpignan. Munster beat Gloucester 7–20 at Kingsholm on 11 January 2014, a win that secured quarter-final qualification. Munster beat Edinburgh 38–6 on 19 January 2014 in Round 6, a bonus-point win that secured a home quarter-final. On 6 February 2014, it was announced that Penney and Backs coach Simon Mannix would be leaving Munster at the end of the 2013–14 season. Former captain and then Forwards coach Anthony Foley was confirmed as the next Munster coach on 19 February 2014. In their quarter-final, Munster beat Toulouse 47–23. Munster lost 24-16 to Toulon in the semi-final on 27 April 2014. Munster finished third in the 2013–14 Pro12, but lost 16–15 to Glasgow Warriors in the semi–final. Munster were drawn in Pool 1 of the 2014–15 European Rugby Champions Cup, alongside Saracens, Clermont Auvergne and Sale Sharks. A late drop-goal from Ian Keatley gave Munster a 26–27 away win against Sale Sharks in Round 1 on 18 October 2014. Munster beats Saracens 14–3 in Round 2 on 24 October 2014. Clermont Auvergne beat Munster 9–16 at Thomond Park in Round 3 on 6 December 2014, becoming the first French team to beat Munster at their home stadium. In the reverse fixture on 14 December 2014, Clermont beat Munster 26–19. Saracens beat Munster 33–10 on 17 January 2015 in Round 5, a defeat which meant Munster failed to qualify for the knockout stages for only the second time in 17 seasons. In Round 6, Munster beat Sale Sharks 65–10, a win that was their 100th in Europe. Munster finished second on the 2014–15 Pro12. In the play-off semi-final, Munster beat Ospreys 21–18. Munster were beaten 13–31 by Glasgow Warriors in the 2015 Pro12 Grand Final on 30 May 2015. Munster were drawn in Pool 4 of the 2015–16 European Rugby Champions Cup, alongside Stade Français, Leicester Tigers and Benetton. On 14 November 2015, Munster beat Treviso 32–7 in their opening pool game. Munster's second pool game, against Stade Français, was postponed following the November 2015 Paris attacks. The match was scheduled to be played at the Stade Jean-Bouin in Paris. Munster lost 19–31 to Leicester Tigers in Round 3 on 12 December 2015. In the return fixture on 20 December 2015, Leicester beat Munster 17–6. On 9 January 2016, Munster lost 27–7 to Stade Français in the re-arranged second pool game. A week later, Munster beat Stade Français 26–13. In their final pool game on 24 January 2016, Munster beat Treviso 5–28. In April 2016, it was confirmed that former Springbok Rassie Erasmus would be joining Munster as the Director of Rugby on a three-year contract, beginning on 1 July 2016. Munster finished 6th in the 2015–16 Pro12. Munster were drawn in Pool 1 of the 2016–17 European Rugby Champions Cup, alongside Racing 92, Leicester Tigers and Glasgow Warriors. In October 2016, Munster's Head Coach and former captain Anthony Foley died while the team were in Paris for the first pool game against Racing 92. Due to the sad and sudden passing of Foley, the fixture was rescheduled. On 22 October 2016, in the first game since Foley's death, Munster beat Glasgow 38–17 at a sold-out Thomond Park. Tributes were paid to Foley before, during and after the game and the number 8 jersey was retired for the game, with CJ Stander wearing the number 24 for the occasion. On 10 December 2016, Munster beat Leicester 38–0 in Round 3 on the Champions Cup. On 17 December 2016, Leicester won the reverse fixture in Welford Road 18–16 after a last-minute penalty from Owen Williams. On 7 January 2017, in the rescheduled Round 1 fixture, Munster beat Racing 92 7–32 away from home. Simon Zebo's opening try was Munster's 400th in European competition. On 14 January 2017, Munster beat Glasgow 12–14 away from home to secure qualification for the quarter-finals. On 21 January 2017, in front of 26,200 spectators in Thomond Park, Munster beat Racing 92 22–10 in Round 6 of the pool stage, securing a home quarter-final On 1 April 2017, in the quarter-final, Munster beat Toulouse 41–16 to progress to the semi-finals. On 22 April 2017, Munster were beaten 26–10 by defending champions Saracens in the Champions Cup semi-final, which was held in the Aviva Stadium, Dublin. Munster finished 1st after the 22-round regular season of the 2016–17 Pro12, with a record total of 86 points. On 20 May 2017, in their play-off semi-final, Munster beat Ospreys 23–3 in Thomond Park. 7 days later, in the 2017 Pro12 Grand Final, Munster lost 46–22 to Scarlets. When the draw for the 2017–18 European Rugby Champions Cup was made, Munster were drawn in Pool 4 alongside Leicester Tigers, Racing 92 and Castres Olympique. It marked the third season in a row in which Munster will face Leicester and the second season in a row in which they will play Racing 92. On 30 June 2017, it was confirmed after weeks of speculation that Director of Rugby Rassie Erasmus and Defence Coach Jacques Nienaber would leave the province in December of that year. In August 2017, Celtic Rugby Limited and the South African Rugby Union confirmed that the two South African teams that had been cut from the southern hemisphere Super Rugby competition, Cheetahs and Southern Kings, would be joining an expanded Pro14 league ahead of the 2017–18 season. Due to the addition of two new teams, the league format was changed to feature two conferences, A and B, with Munster being placed in Conference A alongside Cardiff Blues, Ospreys, Glasgow Warriors, Connacht, Cheetahs and Zebre. In October 2017, Munster confirmed that then-South Africa Forwards Coach Johann van Graan would join the province in November as their new Head Coach. In the same month, it was announced that Munster's all-time leading try scorer, Simon Zebo, would leave the province at the end of the season. In Rounds 1 & 2 of the 2017–18 European Rugby Champions Cup in October 2017, Munster drew 17–17 away to Castres before earning a 14–7 win at home to Racing 92. Erasmus and Nienaber left Munster in early November 2017, with the province confirming their departure on 13 November 2017. Johann van Graan's first official game as Munster's new Head Coach was a 36–19 win away against Zebre in the Pro14 on 26 November 2017. Lions Defence Coach JP Ferreira joined Munster in December 2017. In the December Champions Cup double-header against Leicester Tigers, Munster won 33–10 at home before winning 25–16 away, their first win at Welford Road for 11 years. In doing so, Munster became the first team to defeat Leicester in both games of the double-header since they were introduced in 1999, while the home victory also saw Munster surpass 4,000 points in the competition. In Rounds 5 & 6 of the Champions Cup, Munster lost 34–30 away to Racing 92 before beating Castres 48–3 at home, securing a record 17th quarter-final. Munster beat 3-time tournament champions Toulon 20–19 in the quarter-final after a late Andrew Conway try and conversion from Ian Keatley. In the semi-final, Munster were beaten 27–22 by their French pool 4 opponents Racing 92. Munster finished 2nd in Conference A of the 2017–18 Pro14 season on 69 points. In their semi-final qualifier against Edinburgh on 5 May 2018, Munster won 20–16 to progress to a semi-final away from home. In the semi-final against recently crowned Champions Cup winners and arch-rivals Leinster on 19 May 2018, Munster lost 16–15, bringing to an end their 2017–18 season. Munster played two pre-season fixtures ahead of the 2018–19 campaign, the first against London Irish, whose directory of rugby is former Munster and Ireland head coach Declan Kidney, and the second against Exeter Chiefs, which was the first meeting between the two clubs. Munster beat London Irish 32–28, but lost 12–0 against Exeter Chiefs. Drawn alongside French Top 14 champions Castres and English sides Exeter Chiefs and Gloucester, Munster competed in pool 2 of the 2018–19 European Rugby Champions Cup. Munster opened their 2018–19 Pro14 season with a six-try 38–0 victory against South African side Cheetahs in Thomond Park on 1 September 2018. Rory Scannell, Dave Kilcoyne, Tommy O'Donnell, JJ Hanrahan, Dave O'Callaghan and Man-of-the-Match Darren Sweetnam scored the tries, with Hanrahan adding four conversions, in a match that saw Arno Botha, Mike Haley, Joey Carbery and academy players Shane Daly and Gavin Coombes make their competitive debuts for the province, whilst Neil Cronin also made his first appearance for Munster since March 2015. Tadhg Beirne made his debut for Munster in the provinces 25–10 defeat away to Glasgow Warriors on 7 September 2018. Munster's 64–7 win against Ulster on 29 September 2018 was a record win for the province in the Pro14; Munster's previous record win being 47–0 against Zebre in 2016. In round one of the 2018–19 Champions Cup on 13 October 2018, a try from CJ Stander and five points from the boot of Joey Carbery secured a 10–10 draw in Sandy Park against Exeter Chiefs, in a match in which Dan Goggin and Neil Cronin made their competitive European debuts, whilst Tadhg Beirne, who was Man-of-the-Match, Mike Haley and Joey Carbery made their European debuts for Munster. One week later, tries from Mike Haley, Rhys Marshall, Joey Carbery, who also kicked four conversions and one penalty in a Man-of-the-Match performance, Sam Arnold and Andrew Conway helped Munster to a 36–22 bonus-point victory at home against Gloucester. In the December 2018 back-to-back Champions Cup fixtures against Castres, Munster won 30–5 in round 3 on 9 December, with tries from Rory Scannell, CJ Stander and J. J. Hanrahan, who also scored 15 points off the kicking tee. In the return leg away to Castres on 15 December, the French side won 13–12, with Joey Carbery scoring all of Munster's points from penalties. In round 5 of the Champions Cup, Munster beat Gloucester 41–15 away from home on 11 January 2019, with the tries coming from Joey Carbery (2), Rory Scannell, Keith Earls and Andrew Conway and 16 points of the kicking tee from Carbery. In round 6, Munster beat Exeter Chiefs 9–7 in Thomond Park on 19 January 2019 to advance to a record 18th Champions Cup quarter-final. Joey Carbery scored all of Munster's points from penalties in a closely fought, physical game. Munster defeated Edinburgh 17–13 in their quarter-final in Murrayfield Stadium on 30 March 2019 to advance to a 14th Champions Cup semi-final, which will be against Saracens. The 'three crowns' flag of Munster alludes to the three constituent historic kingdoms of Munster; Thomond in the north, Desmond in the south, and Ormond in the east. A revamped logo was introduced for the 2003–04 season which included the addition of a stag with the three crowns. The new crest was designed by the Limerick graphic design and branding agency Designer's Ink, who received a Gold Award in the Irish Design Effectiveness Awards for the branding and implementation of Munster Rugby. The crest was designed to maintain the three crowns and the new red stag symbolises strength and competitiveness. The decision for change was a product of two-years of planning of research and design. The current kit is made by Adidas, who replaced Canterbury of New Zealand in 2007 in a deal covering kit supply for three seasons. Between 2004 and 2013, Toyota was Munster's primary sponsor, appearing on the front of their jersey. On 21 May 2013, it was announced on that Bank of Ireland would be replacing Toyota as Munster's sponsor. In April 2017, the deal with Bank of Ireland was extended until the end of the 2022–23 season. In August 2017, Munster announced that Shannon Airport had become its 'Official Airport Partner' in a three-year deal, which will see the Shannon Airport logo appear on the players shorts from the 2017–18 season onwards. Munster have two main stadia where they play their home matches – Thomond Park in Limerick and Irish Independent Park in Cork. Thomond Park is the bigger of the two, with a capacity of around 25,600, while Irish Independent Park holds 9,500. As well as Munster, Shannon RFC and UL Bohemians R.F.C. play at the grounds of Thomond Park. Thomond Park is famous for its atmosphere and unique history – its noise during play and complete silence when a player (home or away) is kicking at goal. It was also famous for Munster's intimidating record that it held for over a decade – having never been beaten at home during the Heineken Cup. However, the record was broken during the 2006–07 season when they were defeated by Leicester Tigers. Munster train in the University of Limerick. Thomond Park went through a major renovation in 1999 and in 2006, Munster announced plans to upgrade it. In autumn 2008, the new 26,500 capacity stadium was opened. Two sweeping arches are one of the defining features of the stadium, as well as the concourse outside of the new East Stand. The new stadium design was well received and won the Public Choice Award for 2009 from the Irish Architecture Foundation. A long discussion and consultation on the new name concluded with the decision that the name would remain Thomond Park. 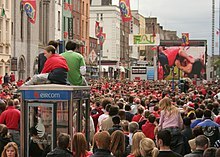 The strength of Munster's support was demonstrated during Munster's 2006 and 2008 Heineken Cup final wins. News reports detailed the lengths that fans were willing to go to secure tickets to the game, with some Munster fans travelling to Biarritz to buy up the French allocation of tickets. On the day of the game the Millennium Stadium in Cardiff was filled with a capacity crowd of 74,500. Of those numbers it is estimated that somewhere between 55,000 and 65,000 were Munster fans with the remainder being neutrals and Biarritz supporters. The Millennium Stadium was intended to be a neutral venue but commentators on the day remarked that it could hardly be counted as such. In North America there is an official supporters club called Munster Rugby USA. Munster played in the most attended semi-final match of the Heineken Cup. 82,208 spectators attended their 2008–09 Heineken Cup semi-final against Irish rivals Leinster, which was played in Croke Park, Dublin. This was also, at the time, the largest crowd ever at a club rugby union match. The record was broken in a league game between English sides Saracens and Harlequins in 2012. Munster's appearance in the 2002 final of the Heineken Cup against Leicester Tigers at the Millennium Stadium, which drew 74,600, was the record attendance for a final in the competition until the 2007 Heineken Cup final between Leicester and London Wasps at the newly expanded Twickenham. Munster's 2005 quarter-final against Biarritz Olympique in Estadio Anoeta, played across the border in Spain in San Sebastián set the record for the biggest rugby match ever played in Spain with an attendance of 32,000. Their October 2006 Celtic League game against Leinster at Lansdowne Road beat the record for that competition with an attendance of 27,252. This record lasted just two months however with the Leinster and Ulster match on 31 December 2006 filling Lansdowne Road (over 48,000 in attendance) for the last match at the stadium before redevelopment. On 2 October 2010, Munster played Leinster in the Round 5 of the Celtic League at the Aviva Stadium, this set a new crowd attendance record for a Celtic League game at 50,645. On 26 December 2017, a new attendance record for Thomond Park in the Pro14 was set when 26,267 were at the Munster v Leinster fixture. Munster fans are known for their silence when a kick is being taken, but also for their noise. Fans repeatedly chant "MUNSTER" or sing "The Fields of Athenry" (an Irish famine song from Galway, Connacht) and "Stand Up and Fight" (from the Broadway musical Carmen Jones.) They sang The Black Velvet Band to the Ospreys' Irish winger Tommy Bowe during their 2009 Heineken Cup quarter final encounter. Tommy Bowe sang this song at the official reception for the 2009 Grand Slam winning Ireland rugby team. Munster Rugby has given the word "Garryowen" to the rugby lexicon. Famously, the Limerick club of Garryowen introduced the "Garryowen kick", a high up and under which puts defending players under pressure. Munster A is the team that represents Munster in the Celtic Cup and in the All-Ireland Inter-Provincial Championship. Pre-professionalism and a formal Celtic league structure, the main Munster team competed in the AIPC. Since the advent of professionalism the provinces have fielded lesser teams in order to concentrate on the Celtic League. The team is composed of Senior Munster squad players requiring gametime, Academy players and All-Ireland League players called up from their club. Having been beaten finalists in the 2009–10 British and Irish Cup, losing 23–14 to Cornish Pirates, Munster A secured success in the British and Irish Cup on 27 April 2012, beating Cross Keys 31–12 in the final of the 2011–12 tournament at Irish Independent Park. On 21 April 2017, Munster A won their second British and Irish Cup, beating English RFU Championship side Jersey Reds 29–28 in the 2016–17 final, which was held in Irish Independent Park. At one point during the first half, Munster A had been losing 18–0, but fought back to secure victory. With 2017–18 being the last season in which the British and Irish Cup was held, the Welsh Rugby Union and Irish Rugby Football Union formed a new tournament, the Celtic Cup, which will feature development squads from the four Irish provinces and four Welsh regions, split into two pools of four. The tournament will run over seven consecutive weeks between 7 September 2018 and 12/13/14 October 2018. ^ 11 teams were involved in this season, so one team did not play each week and were awarded 4 points instead. Therefore, each team finished the season with 8 more points than the table would seem to warrant. For player movements ahead of the 2019–20 season, see List of 2019–20 Pro14 transfers § Munster. ^ a b c Stephen Fitzgerald joined Connacht on a three-month loan in December 2018, which was later extended until the end of the 2018–19 season. Mike Sherry joined Gloucester on loan until the end of the 2018–19 season in March 2019. The Munster Academy Coaching and Management staff for the 2018–19 season. The Munster Academy squad for the 2018–19 season is: Note: Flags indicate national union as has been defined under WR eligibility rules. Players may hold more than one non-WR nationality. ^ Anthony Foley died suddenly on 16 October 2016, just 6 games into Munster's regular season. Figures for Rassie Erasmus, who became Munster's Director of Rugby on 1 July 2016, include those games in which Foley was still Head Coach. The following table shows the players who won at least 200 caps for Munster. All players are Irish, unless otherwise noted. (Correct as of 12 April 2019) Bold indicates highest overall record. All players are Irish unless otherwise indicated. All players are Irish unless otherwise noted. This award recognises the best European player in the Heineken Cup from 1995 to 2010. In 2010, the following Munster players were selected in the ERC European Dream Team, an all–time dream team of Heineken Cup players. ^ CJ Stander became Irish-qualified on 1 November 2015 and now represents the Irish national rugby union team. ^ Thornley, Gerry. "Munster Rugby". The Irish Times. ^ Limerick Rugby Full Of Heroes, The Daily Telegraph, 24 May 2002. Retrieved on 8 March 2011. ^ Limerick Ready To Create Legends, The Independent, 27 May 2000. Retrieved on 8 March 2011. ^ Bates, Rupert (21 May 2006). "Munster savour slice of heaven". The Daily Telegraph. London. ^ Gallagher, Brendan (17 November 2008). "Munster's historic 1978 victory over mighty All Blacks proved a defining moment". The Daily Telegraph. London. ^ "Alone they sit and recall putting mighty Blacks to flight". The Irish Times. ^ "New Zealand Maori pay tribute to late Munster coach Anthony Foley". stuff.co.nz. 12 November 2016. Retrieved 12 November 2016. ^ "Munster 15-6 Australia". BBC Sport. 16 November 2010. Retrieved 31 October 2018. ^ "Class of 2010 Excel". munsterrugby.ie. 17 November 2010. Archived from the original on 26 November 2010. Retrieved 3 February 2013. ^ "Ospreys 27–18 Dragons". BBC Sport. 30 April 2009. Retrieved 30 April 2009. ^ Farrelly, Hugh (17 January 2011). "Munster's epic ends as tragedy". Irish Independent. Retrieved 17 January 2011. ^ "Munster 19–9 Leinster". BBC Sport. 30 May 2011. Retrieved 30 May 2011. ^ Thornley, Gerry (30 May 2011). "Munster close out season in grand style". Irish Times. Retrieved 30 May 2011. ^ "Cometh The Hour, Cometh The Men". munsterrugby.ie. 13 November 2011. Archived from the original on 14 November 2011. Retrieved 13 November 2011. ^ "Same Again Thanks Rog". munsterrugby.ie. 20 November 2011. Archived from the original on 23 November 2011. Retrieved 20 November 2011. ^ "Set-Piece & Defence Gives Munster The Edge". munsterrugby.ie. 11 December 2011. Archived from the original on 11 January 2012. Retrieved 11 December 2011. ^ "Munster Complete The Scarlets Job". munsterrugby.ie. 19 December 2011. Archived from the original on 17 April 2012. Retrieved 20 December 2011. ^ "Fifth Successive Win Sees Munster Through". munsterrugby.ie. 15 January 2012. Archived from the original on 12 February 2012. Retrieved 15 January 2012. ^ "Munster Close The Deal". munsterrugby.ie. 22 January 2012. Archived from the original on 26 January 2012. Retrieved 22 January 2012. ^ "Heartbreak For Munster". munsterrugby.ie. 8 April 2012. Archived from the original on 11 April 2012. Retrieved 22 April 2012. ^ "No Consolation Of Any Sort In This Result". munsterrugby..ie. 12 May 2012. Archived from the original on 13 December 2013. Retrieved 13 May 2012. ^ "Tony McGahan set to leave Munster for Australia at end of season". BBC Sport. 22 February 2012. Retrieved 22 February 2012. ^ "Munster to lose McGahan". irishexaminer.com. 22 February 2012. Retrieved 22 February 2012. ^ "McGahan to quit as Munster coach". planetrugby.com. 22 February 2012. Archived from the original on 21 February 2014. Retrieved 22 February 2012. ^ Fallon, John (23 March 2012). "McGahan excited about Wallaby role". irishtimes.com. Retrieved 30 March 2012. ^ "Penney Appointed". munsterrugby.ie. 2 May 2012. Archived from the original on 4 May 2012. Retrieved 3 May 2012. ^ "Heineken Cup Pools 2012/2013". munsterrugby.ie. 13 June 2012. Archived from the original on 3 November 2012. Retrieved 30 June 2012. ^ "Munster Have To Settle For Losing Bonus". munsterrugby.ie. 13 October 2012. Archived from the original on 16 October 2012. Retrieved 21 October 2012. ^ "End Game Earns Bonus". munsterrugby.ie. 22 October 2012. Archived from the original on 31 March 2013. Retrieved 17 November 2012. ^ "Munster Show Their Gritty Side". munsterrugby.ie. 10 December 2012. Archived from the original on 1 February 2013. Retrieved 12 December 2012. ^ "Munster Lose After Epic Battle". munsterrugby.ie. 17 December 2012. Archived from the original on 31 March 2013. Retrieved 17 December 2012. ^ "Munster Win In Murrayfield". munsterrugby.ie. 13 January 2013. Archived from the original on 13 December 2013. Retrieved 13 January 2013. ^ "Munster Go Through". munsterrugby.ie. 21 January 2013. Archived from the original on 17 February 2013. Retrieved 21 January 2013. ^ "Alone They Stand". munsterrugby.ie. 8 April 2013. Archived from the original on 12 April 2013. Retrieved 8 April 2013. ^ "Munster Lose A Game Of Two Halves". munsterugby.ie. 28 April 2013. Archived from the original on 3 May 2013. Retrieved 29 April 2013. ^ "2012–13 RaboDirect PRO12 League Table". munsterrugby.ie. Archived from the original on 8 August 2013. Retrieved 10 May 2013. ^ "Munster In Pool 6". munsterrugby.ie. 5 June 2013. Archived from the original on 8 September 2013. Retrieved 5 June 2013. ^ "Disappointing Defeat In Murrayfield". munsterrugby.ie. 12 October 2013. Archived from the original on 16 October 2013. Retrieved 19 October 2013. ^ "Heineken Cup Win In Thomond Park". munsterrugby.ie. 19 October 2013. Archived from the original on 21 October 2013. Retrieved 3 November 2013. ^ "Munster Top Of Group After Bonus-Point Win". munsterrugby.ie. 8 December 2013. Archived from the original on 11 December 2013. Retrieved 8 December 2013. ^ "Munster Claim Last-Gasp Win In Perpignan". munsterrugby.ie. 14 December 2013. Archived from the original on 14 December 2013. Retrieved 14 December 2013. ^ "Quarter Final Place Secured". munsterrugby.ie. 12 January 2014. Archived from the original on 12 January 2014. Retrieved 12 January 2014. ^ "Bonus-Point Munster Move Into Home Quarters". munsterrugby.ie. 19 January 2014. Archived from the original on 18 February 2014. Retrieved 19 January 2014. ^ "Move Confirmed For Coaching Duo". munsterrugby.ie. 6 February 2014. Archived from the original on 21 February 2014. Retrieved 6 February 2014. ^ "Foley Confirmed As Next Head Coach". munsterrugby.ie. 19 February 2014. Archived from the original on 22 February 2014. Retrieved 15 April 2014. ^ "Vintage Munster March On". munsterrugby.ie. 5 April 2014. Archived from the original on 7 April 2014. Retrieved 5 April 2014. ^ "Toulon End Munster's European Campaign". munsterrugby.ie. 27 April 2014. Archived from the original on 27 April 2014. Retrieved 27 April 2014. ^ "RaboDirect PRO12 Semi-Final Confirmed". munsterrugby.ie. 10 May 2014. Archived from the original on 12 May 2014. Retrieved 11 May 2014. ^ "Munster Out By Narrowest Of Margins". munsterrugby.ie. 16 May 2014. Archived from the original on 17 May 2014. Retrieved 16 May 2014. ^ "Munster in Pool 1 of Champions Cup". munsterrugby.ie. 10 June 2014. Archived from the original on 23 October 2014. Retrieved 10 June 2014. ^ "Keatley Kicks Munster On". munsterrugby.ie. 18 October 2014. Archived from the original on 19 October 2014. Retrieved 18 October 2014. ^ "Munster Overcome Saracens". munsterrugby.ie. 24 October 2014. Archived from the original on 25 October 2014. Retrieved 25 October 2014. ^ "Clermont Claim Win At Thomond Park". munsterrugby.ie. 6 December 2014. Archived from the original on 13 December 2014. Retrieved 6 December 2014. ^ "Losing Bonus Point Secured At Clermont". munsterrugby.ie. 14 December 2014. Archived from the original on 22 May 2015. Retrieved 14 December 2014. ^ "Munster Lose Out In London". munsterrugby.ie. 17 January 2015. Archived from the original on 17 January 2015. Retrieved 17 January 2015. ^ "Munster Finish With Flourish". munsterrugby.ie. 25 January 2015. Archived from the original on 28 January 2015. Retrieved 25 January 2015. ^ "Munster Do The Job In Cork". munsterrugby.ie. 16 May 2015. Archived from the original on 19 May 2015. Retrieved 16 May 2015. ^ "Final Beckons After Incredible Win". munsterrugby.ie. 23 May 2015. Archived from the original on 30 May 2015. Retrieved 23 May 2015. ^ "Not To Be In Belfast". munsterrugby.ie. 30 May 2015. Archived from the original on 1 June 2015. Retrieved 31 May 2015. ^ "Muster Drawn In Pool 4". munsterrugby.ie. 17 June 2015. Archived from the original on 25 August 2015. Retrieved 17 June 2015. ^ "Job Done In Thomond". munsterrugby.ie. 14 November 2015. Archived from the original on 17 November 2015. Retrieved 14 November 2015. ^ "Stade Francais Fixture Postponed". munsterrugby.ie. 17 November 2015. Archived from the original on 19 November 2015. Retrieved 18 November 2015. ^ "Tigers Pounce In Thomond". munsterrugby.ie. 12 December 2015. Archived from the original on 17 December 2015. Retrieved 13 December 2015. ^ "Champions Cup Defeat At Welford Road". munsterrugby.ie. 20 December 2015. Archived from the original on 8 January 2016. Retrieved 28 December 2015. ^ "Munster Bounce Back In Style At Thomond". munsterrugby.ie. 16 January 2016. Archived from the original on 20 January 2016. Retrieved 16 January 2016. ^ "Munster Finish With A Flourish". munsterrugby.ie. 24 January 2016. Archived from the original on 26 January 2016. Retrieved 24 January 2016. ^ "Director Of Rugby Appointed". munsterrugby.ie. 25 April 2016. Archived from the original on 27 April 2016. Retrieved 25 April 2016. ^ "Champions Cup Rugby Secured". munsterrugby.ie. 7 May 2016. Archived from the original on 10 May 2016. Retrieved 7 May 2016. ^ "Munster To Face Racing, Glasgow & Leicester". munsterrugby.ie. 29 June 2016. Archived from the original on 2 July 2016. Retrieved 29 June 2016. ^ "Statement On The Sudden Passing Of Anthony Foley". munsterrugby.ie. 16 October 2016. Archived from the original on 18 October 2016. Retrieved 16 October 2016. ^ "Garrett Fitzgerald Statement On Anthony Foley". munsterrugby.ie. 16 October 2016. Retrieved 16 October 2016. ^ "Munster Do Foley Proud With Immense Display". munsterrugby.ie. 22 October 2016. Retrieved 22 October 2016. ^ "Magnificent Munster Tame Tigers In Thomond". munsterrugby.ie. 10 December 2016. Retrieved 10 December 2016. ^ "Munster Just Fall Short In Tigers Thriller". munsterrugby.ie. 17 December 2016. Retrieved 17 December 2016. ^ "Munster Deliver Winning Performance". munsterrugby.ie. 7 January 2017. Retrieved 7 January 2017. ^ "Munster Secure Their Place In Champions Cup Quarter-Final". munsterrugby.ie. 14 January 2017. Retrieved 21 January 2017. ^ "Home Quarter Final Secured". munsterrugby.ie. 21 January 2017. Retrieved 22 January 2017. ^ "Munster Back In Champions Cup Semi Finals". munsterrugby.ie. 1 April 2017. Retrieved 2 April 2017. ^ "Memorable European Run Comes To An End". munsterrugby.ie. 22 April 2017. Retrieved 22 April 2017. ^ "Munster Top PRO12 Table With Emphatic Connacht Win". munsterrugby.ie. 6 May 2017. Retrieved 7 May 2017. ^ "Saturday Semi Final Showdown Awaits". munsterrugby.ie. 17 May 2017. Retrieved 19 May 2017. ^ "Munster Secure Guinness PRO12 Final Place". munsterrugby.ie. 21 May 2017. Retrieved 28 May 2017. ^ "Aviva Anguish In PRO12 Final". munsterrugby.ie. 27 May 2017. Retrieved 28 May 2017. ^ "Familiar Look To Champions Cup Pool Draw". munsterrugby.ie. 8 June 2017. Retrieved 8 June 2017. ^ "Coaching Team Announcement". munsterrugby.ie. 30 June 2017. Retrieved 30 June 2017. ^ "Cheetahs & Southern Kings Join New PRO14". Munster Rugby. 1 August 2017. Retrieved 29 August 2017. ^ "Munster Rugby Head Coach Appointment". Munster Rugby. 11 October 2017. Retrieved 11 October 2017. ^ "Zebo to Leave Munster". Munster Rugby. 23 October 2017. Retrieved 23 October 2017. ^ "Honours Even In Castres". Munster Rugby. 15 October 2017. Retrieved 17 December 2017. ^ "Gutsy Win in Thomond". Munster Rugby. 21 October 2017. Retrieved 17 December 2017. ^ "Munster Bid Farewell To Erasmus & Nienaber". Munster Rugby. 13 November 2017. Retrieved 13 December 2017. ^ "Squad Update Pre-Zebre". Munster Rugby. 21 November 2017. Retrieved 13 December 2017. ^ "Bonus-Point Win For Munster In Zebre". Munster Rugby. 26 November 2017. Retrieved 13 December 2017. ^ "JP Ferreira Confirmed As Defence Coach". Munster Rugby. 14 December 2017. Retrieved 14 December 2017. ^ "Bonus-Point Win For Munster Over Tigers". Munster Rugby. 9 December 2017. Retrieved 17 December 2017. ^ "O'Mahony Leads Munster To Famous Win At Welford Road". Munster Rugby. 17 December 2017. Retrieved 17 December 2017. ^ "Stats & Pics: Season So Far". Munster Rugby. 4 January 2018. Retrieved 5 January 2017. ^ "Narrow Defeat For Munster In Paris". Munster Rugby. 15 January 2018. Retrieved 22 January 2018. ^ "Complete Performance Secures 17th Quarter-Final Spot". Munster Rugby. 21 January 2018. Retrieved 22 January 2018. ^ "Conway Magic Topples Toulon". Munster Rugby. 31 March 2018. Retrieved 31 March 2018. ^ "Munster's Champions Cup Dream Ends In Bordeaux". Munster Rugby. 22 April 2018. Retrieved 23 April 2018. ^ "Munster Into PRO14 Semi-Finals After Edging Out Edinburgh". Munster Rugby. 5 May 2018. Retrieved 6 May 2018. ^ "Munster Lose Semi-Final To Leinster By A Point". Munster Rugby. 19 May 2018. Retrieved 20 May 2018. ^ "Munster To Host London Irish & Exeter Chiefs In August". Munster Rugby. 29 May 2018. Retrieved 29 May 2018. ^ "Munster Edge Past London Irish In Cork". Munster Rugby. 17 August 2018. Retrieved 18 August 2018. ^ "Match Report: Munster 0-12 Exeter Chiefs". Munster Rugby. 24 August 2018. Retrieved 25 August 2018. ^ "Tough Draw For Munster In Champions Cup". Munster Rugby. 20 June 2018. Retrieved 20 June 2018. ^ "Match Report | Winning Start at Thomond Park". Munster Rugby. 1 September 2018. Retrieved 1 September 2018. ^ "Report | Munster Fall To Defeat In Glasgow". Munster Rugby. 7 September 2018. Retrieved 8 September 2018. ^ "Report | Record PRO14 Win For Munster Over Ulster". Munster Rugby. 29 September 2018. Retrieved 30 September 2018. ^ "Report | Munster Draw Against Exeter Chiefs". Munster Rugby. 13 October 2018. Retrieved 14 October 2018. ^ "Report | Bonus-Point Win Over Gloucester At Thomond". Munster Rugby. 20 October 2018. Retrieved 20 October 2018. ^ "Report | Hanrahan Leads Munster To Castres Win". Munster Rugby. 9 December 2018. Retrieved 15 December 2018. ^ "Report | Losing Bonus Point For Munster In Castres". Munster Rugby. 15 December 2018. Retrieved 15 December 2018. ^ "Report | Bonus-Point Win At Kingsholm". Munster Rugby. 11 January 2019. Retrieved 19 January 2019. ^ "Report | Munster Into 18th European Quarter-Final". Munster Rugby. 19 January 2019. Retrieved 19 January 2019. ^ "Report | Munster Into 14th European Semi-Final". Munster Rugby. 30 March 2019. Retrieved 30 March 2019. ^ a b c Simon Lewis (3 July 2003). "New Munster kit and logo to save revenue, not exploit fans". Irish Examiner. Archived from the original on 29 September 2007. Retrieved 13 March 2007. ^ Designers Ink (1 July 2003). "Munster crest and branding implementation by Designers Ink". Designer's Ink. Retrieved 23 June 2016. ^ "Multi-million euro boost for Munster after Bank of Ireland secured as new sponsor". independent.ie. 21 May 2013. Retrieved 21 May 2013. ^ "Bank of Ireland To Lineout With Munster Until 2023". munsterrugby.ie. 13 April 2017. Retrieved 14 April 2017. ^ "Munster Partner With Shannon Airport". Munster Rugby. 31 August 2017. Retrieved 1 September 2017. ^ "Details for Thomond Park, Limerick". Worldstadia.com. Retrieved 13 March 2007. ^ "Tigers storm Thomond Park". European Rugby Cup. Archived from the original on 18 February 2007. Retrieved 13 March 2007. ^ "Thomond to keep it's name". Ireland.com. Retrieved 15 June 2008. ^ "Hunt for Cup Final tickets heats up". The Irish Post. Retrieved 13 March 2007. ^ "Munster Rugby USA". Munster Rugby. Archived from the original on 9 March 2007. Retrieved 13 March 2007. ^ "Match Report: Munster v Leinster". European Rugby Cup. 2 May 2009. Archived from the original on 8 January 2010. Retrieved 2 May 2009. ^ "The seventh Heineken Cup final". European Rugby Cup. Archived from the original on 15 November 2006. Retrieved 13 March 2007. ^ "Biarritz Move Into Final Four". European Rugby Cup. Archived from the original on 25 November 2006. Retrieved 13 March 2007. ^ "Leinster 27–20 Munster". BBC Sport. 6 October 2006. Retrieved 13 March 2007. ^ Stokes, Jim (22 December 2006). "The final curtain". BBC Sport. Retrieved 13 March 2007. ^ "Leinster overcome Munster in front of record crowd". Magners League. 2 October 2010. Archived from the original on 8 October 2010. Retrieved 2 October 2010. ^ Keane, Billy. "Myopic Munster fans a blight on old rivalry". Irish Independent. Archived from the original on 18 February 2013. Retrieved 22 April 2008. ^ "Munster Rugby : Rugby : Results & Fixtures : Munster 'A' Fixtures". Munsterrugby.ie. 2012-11-27. Retrieved 2013-08-14. ^ "Munster Welcome New Academy Players On Board". Archived from the original on 28 May 2010. Retrieved 26 May 2010. ^ "British & Irish Cup Defeat". munsterrugby.ie. 16 May 2010. Archived from the original on 19 November 2011. Retrieved 29 April 2012. ^ "Munster Prove Too Strong". munsterrugby.ie. 27 April 2012. Archived from the original on 1 May 2012. Retrieved 29 April 2012. ^ "Munster A Claim B&I Cup Title After Cork Rollercoaster". munsterrugby.ie. 21 April 2017. Retrieved 22 April 2017. ^ "IRFU & WRU Launch The Celtic Cup to Develop Emerging Talent". Munster Rugby. 15 August 2018. Retrieved 16 August 2018. ^ "Celtic Cup Glory". munsterrugby.ie. 14 May 2005. Archived from the original on 18 December 2010. Retrieved 23 January 2012. ^ "Munster Claim Setanta Challenge Cup". munsterrugby.ie. 27 August 2007. Archived from the original on 18 November 2011. ^ "Munster Retain The Setanta Cup". munsterrugby.ie. 31 August 2008. Archived from the original on 30 September 2010. ^ "Munster Rugby | 1st Team Squad". Munster Rugby. Retrieved 6 July 2018. ^ "Squad Update | Pre-Leinster". Munster Rugby. 27 December 2018. Retrieved 28 December 2018. ^ a b "Sherry Signs Loan Deal With Gloucester". Munster Rugby. 22 March 2019. Retrieved 22 March 2019. ^ "Munster Rugby | Academy Squad". Munster Rugby. Retrieved 5 July 2018. ^ "Johann van Graan to join Munster as head coach" (Press release). South African Rugby Union. 12 October 2017. Retrieved 12 October 2017. ^ "Munster Lions". Munster Lions. Archived from the original on 22 October 2013. Retrieved 2013-08-14. ^ Tyler Bleyendaal became Irish-qualified in 2018. ^ Jean Kleyn will become Irish-qualified in September 2019. ^ Rhys Marshall will become Irish-qualified in November 2019. ^ Chris Cloete will become Irish-qualified in November 2020. ^ Ciaran Parker is Irish-qualified, though he hasn't represented Ireland at this time. ^ Mike Haley is Irish-qualified, though he hasn't represented Ireland at this time. ^ "ERC Player Honour For O'Gara". irishrugby.ie. 16 May 2010. Retrieved 26 February 2017. ^ "Five Irish Players Included In ERC Dream Team". irishrugby.ie. 16 May 2010. Retrieved 14 January 2017. ^ "Leinster dominate Magners dream team". rte.ie. 27 May 2008. Retrieved 6 May 2014. ^ "Four Munster Players On Magners Dream Team". munsterrugby.ie. 5 May 2009. Archived from the original on 6 May 2014. Retrieved 6 May 2014. ^ "Magners League 'Dream Team' announced". espn.co.uk. 28 May 2010. Retrieved 6 May 2014. ^ "O'Gara The Sole Inclusion". munsterrugby.ie. 5 May 2011. Archived from the original on 6 May 2014. Retrieved 6 May 2014. ^ "Five provincial players in Rabo Pro12 Dream Team". rte.ie. 3 May 2012. Retrieved 6 May 2014. ^ "Kilcoyne And Laulala Named In Dream Team". munsterrugby.ie. 5 May 2014. Archived from the original on 6 May 2014. Retrieved 6 May 2014. ^ "Stander & O'Donnell Make PRO12 Dream Team". munsterrugby.ie. 11 May 2015. Archived from the original on 18 May 2015. Retrieved 11 May 2015. ^ "Connacht's Bundee Aki named PRO12 Players' Player of the Year". skysports.com. 8 May 2016. Retrieved 9 May 2016. ^ "6 Munster Players Included In PRO12 Dream Team". munsterrugby.ie. 5 May 2017. Retrieved 5 May 2017. ^ "Beirne Wins PRO14 Players' Player Of The Season Award". Munster Rugby. 20 August 2018. Retrieved 21 August 2018. ^ "PRO12 Awards For Penney & Hanrahan". Munster Rugby. 11 May 2014. Retrieved 26 February 2017. Wikimedia Commons has media related to Munster Rugby.